Posted on Thu, Dec 16, 2010 : 1:38 p.m.
Eastern Michigan University unveiled the dramatic new interior of its $90 million Science Complex this morning. The complex includes a "spherical classroom/planetarium," suspended five stories above the ground. It can be hard for Eastern Michigan University astronomy students to study the night skies during the cloudy winter Michigan months. That will start to change in a couple weeks, thanks to a new planetarium that’s part of the $90 million in renovations to what is becoming the university’s Science Complex. University and state officials unveiled the renovations during an event this morning — complete with students pulling large plastic sheeting from the top floors of the atrium to reveal the new planetarium. When clouds cover the skies, EMU students will be able to come inside the planetarium and see the skies projected on a 28-foot sphere. “We’ll be able to project the skies in 3-D, which will make it easier for students to study them than when we did it on 2-D screens,” said Jim Carroll, the head of EMU’s physics and astronomy department. The plan is to schedule EMU classes in the space Monday through Thursday, and then use it on Fridays to host local schools’ explorations of the heavens. Plans call for opening the space to the community on the weekends. The planetarium, and the five-floor spherical atrium, are the most striking features of the new complex, which added 80,000 square feet to the existing 180,000-square-foot Mark Jefferson building. It will house the biology, chemistry, geography and geology, physics and astronomy and psychology departments. Now that the addition is complete, renovations are expected to begin in January on the Mark Jefferson building, officials said. The addition has 35 science labs. “In the science complex, the research spaces are student spaces,” said Ross Nord, the head of EMU’s chemistry department. 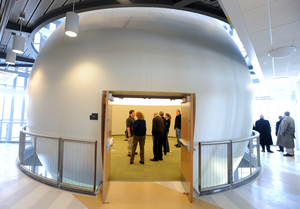 Looking inside the "spherical classroom/planetarium" suspended five stories above the ground. The building’s cost was entirely funded by EMU, through a 4 percent facility fee that students started paying in June 2005, EMU Board of Regents Chairman Roy Willbanks told the crowd gathered for the opening. 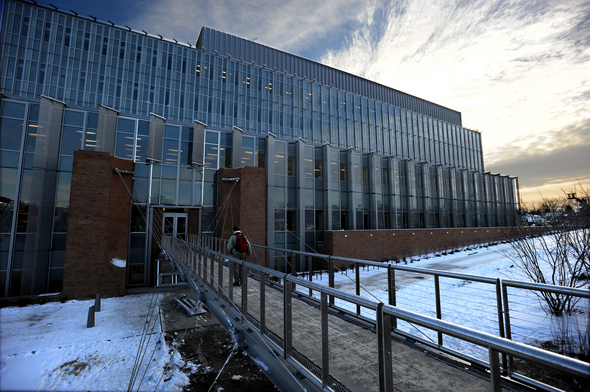 “This building represents the ongoing transformation of Eastern Michigan University,” he said. University officials hope to renovate Strong Hall as the final part of the Science Complex project. However, $28 million in funding for that project was recently yanked out of the latest capital outlay bill by the state Legislature at the last moment. During her remarks, EMU President Susan Martin said that isn’t deterring the university. “We have high hopes of getting (money from) the capital outlay appropriation for the last piece — Strong Hall,” she said, glancing over at Lt. Gov-elect Brian Calley, who was at the event. ”This science complex will help EMU meet the national need for more teachers in science, technology, engineering and math." The renovation is the largest construction project ever on EMU’s campus. Sat, Dec 18, 2010 : 8:26 p.m. I have been a practicing scientist since graduating from EMU chemistry with my BS in 2006. I had an extremely good training and experience there. At that time we were doing lots of great research with very very limited equipment and totally outdated facilities. The others that graduated with me went on to careers in science and very good graduate positions. Fri, Dec 17, 2010 : 7:08 p.m.
No tuition hikes on students, new science building, beautiful student center, updating the athletic facilities... Looks like someone around here has a focus on students and I for one support it 110%. Go Green...Go White!!! Fri, Dec 17, 2010 : 2:34 p.m.
"I would be interested to know how many serious science professionals out there went to EMU to major in science." Even if EMU isn't pumping out scientists, how many professionals have earned their undergrad at EMU to possibly go to a well known science school and earn their PHD? I read success stories all the time where many professionals have earned their undergrad at EMU to continue their educations to the Masters/PHD level either at EMU or someplace else. On another note, I commend EMU for funding this science complex while freezing tuition and other expenses. Lets see if they can still do it in 2011? Fri, Dec 17, 2010 : 8:50 a.m.
90 million bucks, you gotta be kidding me. Why do all these public school buildings have to look like they are the world HQ for a Fortune 100 company. This probably could have been done for 45 million or less. Wasteful spending in my opinion. Fri, Dec 17, 2010 : 8:34 a.m. Being a 1989 graduate of EMU, it's nice to see a thriving university and all the new "additions" to campus over the years. Thu, Dec 16, 2010 : 11:22 p.m. Wonderful! EMU is now spending money on facilities for students rather than for administrators and their cronies. Thu, Dec 16, 2010 : 10:31 p.m.
For those negating the fact that money could be best spent elsewhere, many courses are taken by students in other areas of study. I wasn't necessarily going for a science degree when I was taking courses in MJ to be in elementary education. There are many courses offered to many different majors as a part of their program of study. This building applies to all undergraduate students and those in their respective programs that are housed in the facility so far that I know. Now lets work on the COB downtown and take care of something we'd all be proud to raise money to redo. Thu, Dec 16, 2010 : 6:40 p.m.
Thu, Dec 16, 2010 : 6:10 p.m.
A few notes on those questioning this project's usefulness: - It will be used not just by EMU, but also by the community and local schools on Friday and weekends - It was designed by a Michigan company (keeping money in local economy) - It was built by a Michigan company (keeping money in local economy) - The EMU physics dept just won a $600k grant in order to expand its physics program. "Nationally, the shortage of physicists is well-documented. Eastern Michigan was recently recognized as one of the top producers of physics majors in the country by the American Institute of Physics, and this grant builds on that recognition, said James Carroll, department head of EMUs Department of Physics and Astronomy." http://www.emich.edu/univcomm/releases/press_release.php?id=1278961251 This was a good use of money - in education, in the hard sciences. Thu, Dec 16, 2010 : 6:09 p.m. It looks like a lovely facility. They deserve it. Thu, Dec 16, 2010 : 5:56 p.m. The regular naysayers are neighing. Thu, Dec 16, 2010 : 5:52 p.m. Whether EMU is a leader in the area of science isn't the point. There comes a time when universities need to update their facilities and I'm sure this is a welcome addition for the EMU community. I wish them all the best and for the future updating of their campus infrastructure. Thu, Dec 16, 2010 : 5:38 p.m.
Thu, Dec 16, 2010 : 4:47 p.m. Somehow I think there are better places to spend $90M than on an astronomy building. Thu, Dec 16, 2010 : 4:39 p.m. It is important to the regional and national economy that EMU astronomy students be able to study the night sky more often in cloudy Michigan. Where would the state be if they can't? Please re-run this story the next time you run a story about the financial difficulties of our universities. Thu, Dec 16, 2010 : 2:59 p.m.
it doesn't clearly state if classes will be held there this coming winter term. i hope parking returns back to normal...well...at least sort of. Thu, Dec 16, 2010 : 2:53 p.m.
Nice to see the renovations to Mark Jefferson come to fruition with these state of the art changes to the building and its expansion into a science complex worthy of hosting EMU's science students. Thu, Dec 16, 2010 : 2:48 p.m. Finally!!! Some real investments into the University, the State, and the Nation.